Haley Vicente has a remarkable sense of timing. 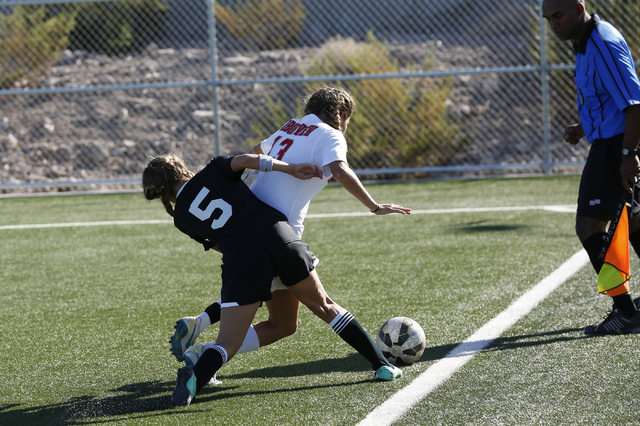 The senior forward for the Arbor View girls soccer team scored the winning goal in the Division I Sunset Region semifinals Thursday, and she came through again Saturday when the Aggies needed it most. Vicente scored three times, including two goals in a four-minute span late in the second half, to lift Arbor View to a 4-3 victory over Palo Verde in the region final at Heritage Park. 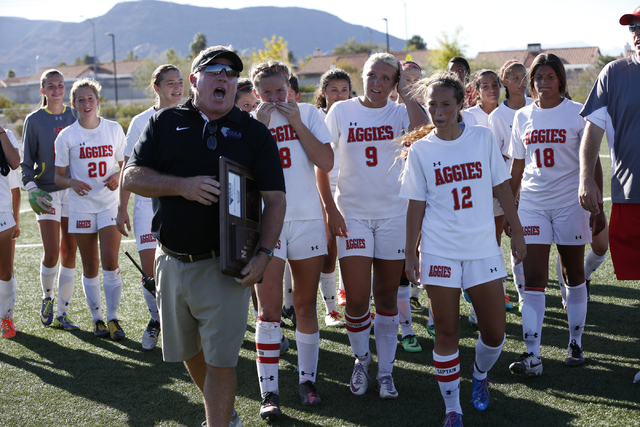 “She makes big plays at big times, for sure,” Aggies coach Jay Howard said. 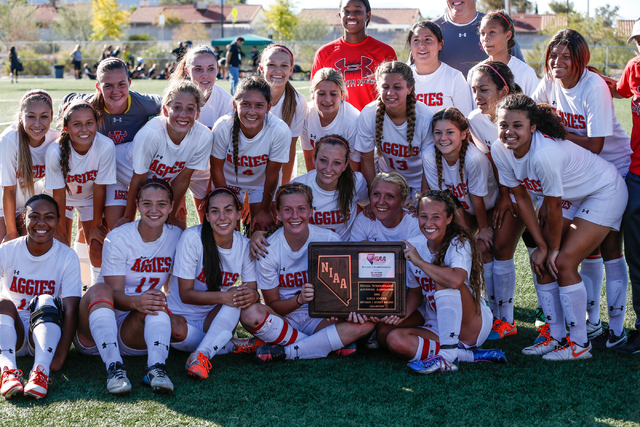 Arbor View (18-2-1), which won its third straight Sunset championship, advanced to the Division I state tournament to face a team to be determined at 6 p.m. Friday at Heritage Park. The Aggies are the two-time defending state champions. Palo Verde (14-4-4) takes on Sunrise Region runner-up Green Valley (16-5-1) at 6 p.m. Monday at Clark to determine the final state berth. The Panthers erased Arbor View’s 2-0 halftime lead in the first 11 minutes of the second half, but Vicente broke the deadlock in the 70th minute. 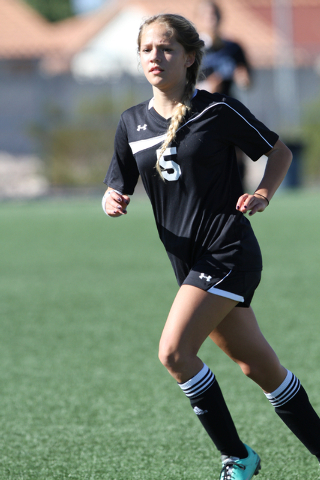 She picked up the ball near midfield and raced past a Palo Verde defender before blasting in a low shot that made the score 3-2. In the 74th minute, Jamie Wilson sent a pass into the penalty area, and Vicente headed it to herself to avoid one defender. She then controlled the ball and knocked it into the empty net to complete her hat trick and give the Aggies an all-important two-goal lead. 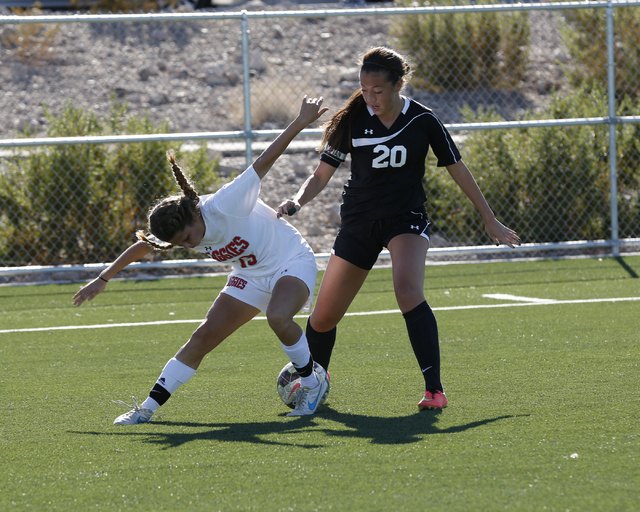 Vicente converted a penalty kick midway through the first half to give Arbor View a 1-0 lead, and Katelyn Laurente redirected Allyssa Larkin’s cross in the 31st minute to put the Aggies up 2-0. Jadyn Nogues had two goals for Palo Verde, including a header off a free kick in the 78th minute that cut the Aggies’ lead to 4-3. Tessa Dwyer scored in the 44th minute to make the score 2-1, and Macee Barlow added two assists. 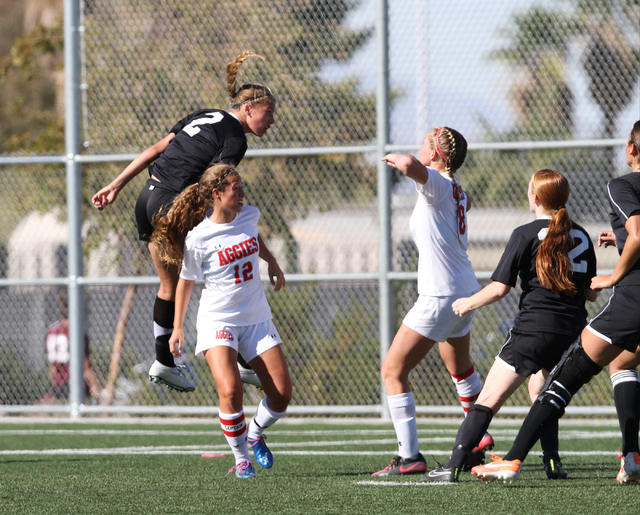 Coronado’s Ashley Thomas had a goal and an assist to lead the Cougars to a 2-1 victory over Green Valley in the Sunrise Region championship game. With the game tied 1-1 late in the first half, Morris made a run down the middle, then left the ball for Thomas, who scored the go-ahead goal a left-footed shot. “It took us awhile to get into our possession game that we normally play, but we were able to connect when we needed to connect and score the goals and hang onto it there at the end,” Neel said. The Cougars (15-7) took the lead in the 19th minute when Taylor Kornieck ran onto a pass from Thomas and drilled a right-footed shot to the far post from just inside the 18-yard box. Green Valley (16-5-4) wasted no time answering, scoring immediately after the restart. Alexis Kirson settled the ball at the top of the box, turned inside and ripped a right-footer inside the right post. The Gators continued to push until the end and nearly tied it in the final minute when Kirson slipped the ball ahead to Sydney Holborrow. Holborrow outran a defender and hit a strong shot, but Coronado keeper Shannon Heenan snagged the ball just before the final whistle. The Cougars advance to the state tournament, which begins Friday at Heritage Park. It was a defensive battle for most of the Division I-A Southern Region championship game. 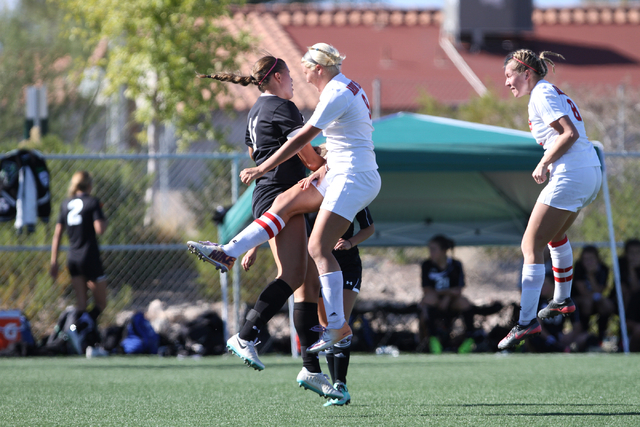 Faith Lutheran’s Brenna Rohnkohl finally crashed the party during the 60th minute. The junior took a cross from Kristi Chinn and lasered the ball past Sierra Vista goalkeeper Jayla Olson into the bottom right corner of the net. The goal held up for a 1-0 victory to give the Crusaders the region title. Both teams advance to this weekend’s state tournament at Heritage Park. 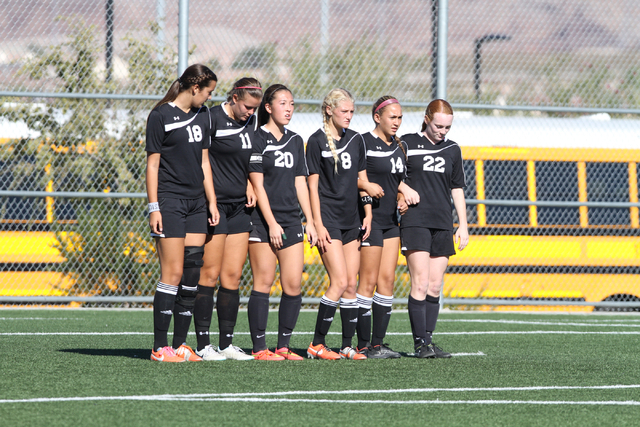 Faith Lutheran, which has played 10 games decided by one goal this season, was in a familiar position holding a slim lead late. The Crusaders (18-6-3) got solid contributions on defense by Brooke Nigro and Kayla Murai to outlast the Mountain Lions (11-5-2). Faith Lutheran keeper Beka Lescenski made a lead-preserving save with less than five minutes remaining. 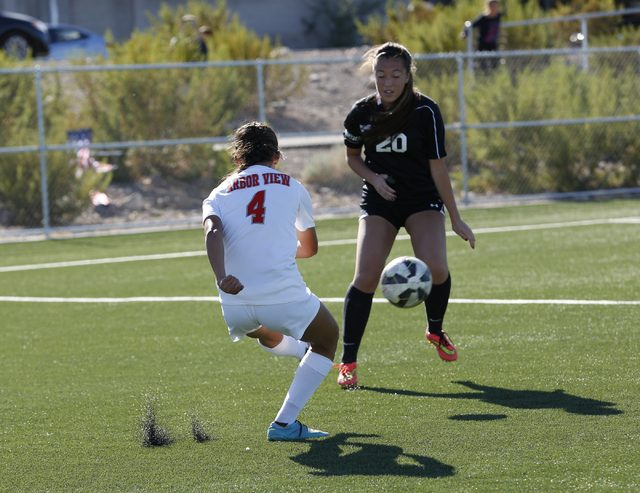 Sierra Vista’s Calista Reyes put a free kick on target from 30 yards, but Lescenski stepped in front and corralled it. Lescenski, who finished with nine saves, recorded her seventh shutout of the season.